A surprising number of Victorian scientists wrote poetry. Many came to science as children through such games as the spinning-top, soap-bubbles and mathematical puzzles, and this playfulness carried through to both their professional work and writing of lyrical and satirical verse. This is the first study of an oddly neglected body of work that offers a unique record of the nature and cultures of Victorian science. Such figures as the physicist James Clerk Maxwell toy with ideas of nonsense, as through their poetry they strive to delineate the boundaries of the new professional science and discover the nature of scientific creativity. 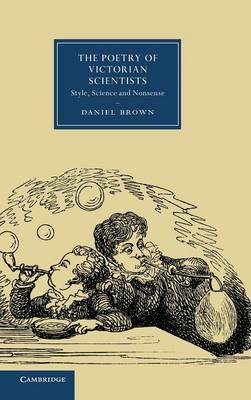 Also considering Edward Lear, Daniel Brown finds the Victorian renaissances in research science and nonsense literature to be curiously interrelated. Whereas science and literature studies have mostly focused upon canonical literary figures, this original and important book conversely explores the uses literature was put to by eminent Victorian scientists.